^ a b c d Smith, B. A.; Soderblom, L. A.; Johnson, T. V.; et al. (1979). “The Jupiter System through the Eyes of Voyager 1”. Science 204 (4396): 951–957, 960–972. Bibcode: 1979Sci...204..951S. doi:10.1126/science.204.4396.951. PMID 17800430. ^ a b c d e f g h i j k l m n o p q r s t u v w x y z aa ab ac Ockert-Bell, M. E.; Burns, J. A.; Daubar, I. J.; et al. (1999). “The Structure of Jupiter’s Ring System as Revealed by the Galileo Imaging Experiment”. Icarus 138 (2): 188-213. Bibcode: 1999Icar..138..188O. doi:10.1006/icar.1998.6072. ^ a b c d e f g h i j k Meier, R.; Smith, B. A.; Owen, T. C.; et al. (1999). “Near Infrared Photometry of the Jovian Ring and Adrastea”. Icarus 141 (2): 253–262. Bibcode: 1999Icar..141..253M. doi:10.1006/icar.1999.6172. ^ a b c d e f g h i j k l m n de Pater, I.; Showalter, M. R.; Burns, J. A.; et al. (1999). “Keck Infrared Observations of Jupiter's Ring System near Earth's 1997 Ring Plane Crossing” (pdf). Icarus 138 (2): 214–223. Bibcode: 1999Icar..138..214D. doi:10.1006/icar.1998.6068. http://www.astro.umd.edu/~hamilton/research/reprints/DePater99.pdf. ^ a b c d e f g h i Showalter, M. R.; Burns, J. A.; Cuzzi, J. N.; Pollack, J. B. (1987). “Jupiter's Ring System: New Results on Structure and Particle Properties”. Icarus 69 (3): 458–498. Bibcode: 1987Icar...69..458S. doi:10.1016/0019-1035(87)90018-2. ^ a b c d e f Esposito, L. W. (2002). “Planetary rings”. Reports on Progress in Physics 65 (12): 1741–1783. Bibcode: 2002RPPh...65.1741E. doi:10.1088/0034-4885/65/12/201. http://www.iop.org/EJ/abstract/0034-4885/65/12/201. ^ a b Morring, F. (May 7, 2007). “Ring Leader”. Aviation Week & Space Technology: 80–83. ^ a b c d e f g h i j k l m Throop, H. B.; Carolyn C. Porco; West, R. A.; et al. (2004). “The Jovian Rings: New Results Derived from Cassini, Galileo, Voyager, and Earth-based Observations” (pdf). Icarus 172 (1): 59–77. Bibcode: 2004Icar..172...59T. doi:10.1016/j.icarus.2003.12.020. http://ciclops.org/media/sp/2007/2687_7449_0.pdf. ^ a b c d e f g h i j k l m n o p q r s t u v w x y z aa ab ac ad ae af ag ah ai Burns, J.A. ; Simonelli; Showalter; Hamilton; Porco; Throop; Esposito; Simonelli, D. P.;Showalter, M.R. et al. (2004). 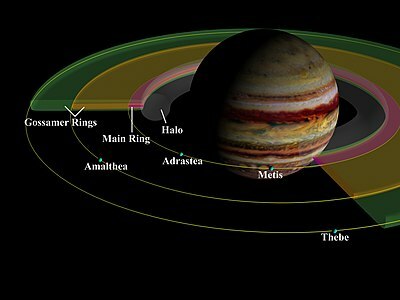 “Jupiter's Ring-Moon System”. In Bagenal, F.; Dowling, T.E. ; McKinnon, W.B. (pdf). Jupiter: The Planet, Satellites and Magnetosphere. Cambridge University Press. 241. http://www.astro.umd.edu/~hamilton/research/preprints/BurSimSho03.pdf. ^ a b "Lunar marriage may have given Jupiter a ring", New Scientist, March 20, 2010, p. 16. ^ a b c d e f Showalter, Mark R.; Cheng, Andrew F.; Weaver, Harold A.; et al. (2007). “Clump Detections and Limits on Moons in Jupiter's Ring System”. Science 318 (5848): 232–234. Bibcode: 2007Sci...318..232S. doi:10.1126/science.1147647. PMID 17932287. ^ a b c Wong, M. H.; de Pater, I.; Showalter, M. R.; et al. (2006). “Ground-based Near Infrared Spectroscopy of Jupiter's Ring and Moons”. Icarus 185 (2): 403–415. Bibcode: 2006Icar..185..403W. doi:10.1016/j.icarus.2006.07.007. ^ a b McMuldroch, S.; Pilortz, S. H.; Danielson, J. E.; et al. (2000). “Galileo NIMS Near-Infrared Observations of Jupiter's Ring System”. Icarus 146 (1): 1–11. Bibcode: 2000Icar..146....1M. doi:10.1006/icar.2000.6343. ^ a b Brooks, S. M.; Esposito, L. W.; Showalter, M. R.; et al. (2004). “The Size Distribution of Jupiter's Main Ring from Galileo Imaging and Spectroscopy”. Icarus 170 (1): 35–57. Bibcode: 2004Icar..170...35B. doi:10.1016/j.icarus.2004.03.003. ^ a b c d e f Burns, J.A. ; Hamilton, D.P. ; Showalter, M.R. (2001). “Dusty Rings and Circumplanetary Dust: Observations and Simple Physics”. In Grun, E.; Gustafson, B. A. S.; Dermott, S. T.; Fechtig H. (pdf). Interplanetary Dust. Berlin: Springer. pp. 641–725. http://www.astro.umd.edu/~hamilton/research/preprints/BurHamSho01.pdf. ^ Anderson, J. D.; Johnson, T. V.; Shubert, G.; et al. (2005). “Amalthea's Density Is Less Than That of Water”. Science 308 (5726): 1291e1293. Bibcode: 2005Sci...308.1291A. doi:10.1126/science.1110422. PMID 15919987. ^ a b c d e f g h i j Burns, J. A.; Showalter, M. R.; Hamilton, D. P.; et al. (1999). “The Formation of Jupiter's Faint Rings” (pdf). Science 284 (5417): 1146–1150. Bibcode: 1999Sci...284.1146B. doi:10.1126/science.284.5417.1146. PMID 10325220. http://www.astro.umd.edu/~hamilton/research/reprints/BurnsShowHam99.pdf. ^ a b c Showalter, M. R.; Hedman, M. M.; Burns, J. A. (2011). “The impact of comet Shoemaker-Levy 9 sends ripples through the rings of Jupiter”. Science 332 (6030): 711. Bibcode: 2011Sci...332..711S. doi:10.1126/science.1202241. ^ Hedman, M. M.; Burns, J. A.; Evans, M. W.; Tiscareno, M. S.; Porco, C. C. (2011). “Saturn's curiously corrugated C Ring”. Science 332 (6030): 708. Bibcode: 2011Sci...332..708H. doi:10.1126/science.1202238. ^ a b Hamilton, D. P. (1994). “A Comparison of Lorentz, Planetary Gravitational, and Satellite Gravitational Resonances” (pdf). Icarus 109 (2): 221–240. Bibcode: 1994Icar..109..221H. doi:10.1006/icar.1994.1089. http://www.astro.umd.edu/~hamilton/research/reprints/Ham94.pdf. ^ a b Burns, J.A. ; Schaffer, L. E.; Greenberg, R. J. et al. (1985). “Lorentz Resonances and the Structure of the Jovian Ring”. Nature 316 (6024): 115–119. Bibcode: 1985Natur.316..115B. doi:10.1038/316115a0. ^ a b c d e Showalter, Mark R.; de Pater, Imke; Verbanac, Guili et al. (2008). “Properties and dynamics of Jupiter's gossamer rings from Galileo, Voyager, Hubble and Keck images” (pdf). Icarus 195 (1): 361–377. Bibcode: 2008Icar..195..361S. doi:10.1016/j.icarus.2007.12.012. http://www.astro.umd.edu/~hamilton/research/reprints/ShoPatVer08.pdf. ^ a b c d e f g h Kruger, Harald; Hamilton, Duglas P.Moissl, Richard; and Grun, Eberhard (2009). “Galileo In-Situ Dust Measurements in Jupiter's Gossamer Rings”. Icarus 2003 (1): 198–213. arXiv:0803.2849. Bibcode: 2009Icar..203..198K. doi:10.1016/j.icarus.2009.03.040. ^ Fieseler, P.D. ; et al. (2004). “The Galileo Star Scanner Observations at Amalthea”. Icarus 169 (2): 390–401. Bibcode: 2004Icar..169..390F. doi:10.1016/j.icarus.2004.01.012. ^ a b Hamilton, Douglas P.; Kruger, Harold (2008). “The sculpting of Jupiter's gossamer rings by its shadow” (pdf). Nature 453 (7191): 72-75. Bibcode: 2008Natur.453...72H. doi:10.1038/nature06886. PMID 18451856. http://www.astro.umd.edu/~hamilton/research/reprints/HamKru08.pdf. ^ Fillius, R. W.; McIlwain, C. E.; Mogro-Campero, A. (1975). “Radiation Belts of Jupiter-A Second Look”. Science 188 (4187): 465–467. Bibcode: 1975Sci...188..465F. doi:10.1126/science.188.4187.465. PMID 17734363. ^ Brown, R. H.; Baines, K. H.; Bellucci, G.; et al. (2003). “Observations with the Visual and Infrared Mapping Spectrometer (VIMS) during Cassini's Flyby of Jupiter”. Icarus 164 (2): 461–470. Bibcode: 2003Icar..164..461B. doi:10.1016/S0019-1035(03)00134-9.